Sanctum 2 is the second game within a month to put a twist on the classic tower defence genre. Last week's CastleStorm was the first, with it's ballista, spells and third person hack-and-slash gameplay, and now Coffee Stain Studios has had a go. They have developed a sequel to Sanctum, a tower defence game combined with a first person shooter. Instead of being some omnipresent tower builder, you are down on the battlefield, not only building towers but using a variety of your own weapons and perks to destroy the enemy. CastleStorm was a smash hit (check out our review here! ), but will Sanctum 2 have the same level of success or not? Read on to find out! In Sanctum 2, you choose to play as one of four characters, each with a very different weapon, and your goal is to protect the Core. 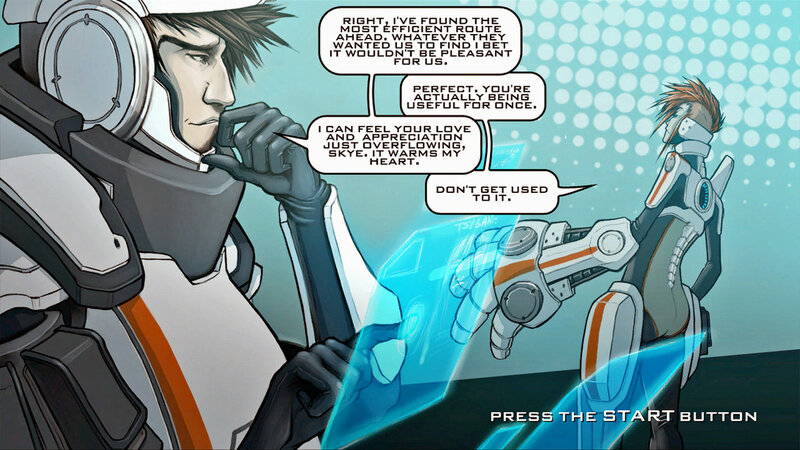 The story is told in a comic book style, and whilst it looks awesome, it is not gripping at all. You probably won't remember the plot. As the game starts, you get a chance to look around and take in the visuals and setting. The graphics really are good for an arcade game, and the design of the architecture, objects and weapons is reminiscent of the Mass Effect universe. Coffee Stain Studios have created an impressive game world, even though you won't really have much time to enjoy it due to all of the alien creature killing. The game takes on the traditional mechanics of tower defence games, giving you time to build and upgrade towers before each wave of enemies. The great thing about Sanctum 2 is that it tells you how many of each enemy type are going to try and break through your defences, and it's an especially helpful feature when the enemies are coming from two or three different points. There are quite a lot of enemies too, from small bugs to giant mechs, attacking from both the land and air. Each of the four characters has their own weapon and abilities. There is an assault rifle, shotgun, sniper and rocket launcher, and you can also choose from a decent number of secondary weapons. The FPS controls are smooth and precise, and the character movement feels spot on, as you sprint and jump around the map with no trouble. There is also a perk system in place, unlocked when you reach a certain level. They have various bonuses, such as splash lightning damage on your bullets, and a regenerating core, and they really help when the levels start to get really tough. Playing in coop mode is a lot of fun. It's basically the same, but with 1-3 other players helping you out. 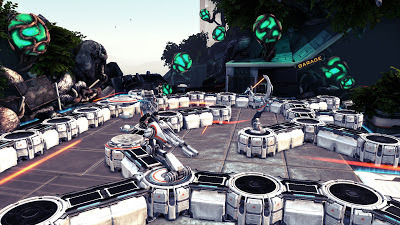 The resources and tower bases are given to each player, but as they spawn on the map as opposed to in your inventories, you may need to watch out for greedy players who don't quite understand what cooperative means. Another problem with the online play is that not everyone is able to build towers in each building phase. Just one or sometimes two players get the privilege, so when you're playing with strangers, this can be an issue. Playing with friends is definitely the way to go, and better strategies usually occur in private matches. Sanctum 2 is yet another fantastic hybrid tower defence game. The first person gameplay works surprisingly well in the tower defence environment, and as in most games, the coop mode is a lot of fun. The graphics are extremely impressive for an arcade title, and the gameplay will have you hooked. It isn't perfect (the story is completely forgettable, not everyone can build towers in coop mode), but what is? Sanctum 2 is definitely worth the asking price of 1200MSP on XBLA, or £11.99 on Steam. Go check it out!